Natural gas is considered a better complement to wind and solar power than coal or nuclear both in terms of the flexibility of gas turbines and carbon emissions. But gas prices in Germany have remained high in recent years, and the carbon price has been too low to incentivize a switch from coal to gas. Now, there are signs that gas turbines are once again profitable. Craig Morris reports. Recently, I wrote about how low oil and coal prices have not reduced investments in wind and solar power. But gas prices are also down. The result is not (yet) lower investments in renewables, but natural gas has once again become profitable, at least for the time being. Higher natural gas consumption is, of course, not a goal of the Energiewende (lower fossil fuel consumption is), but in the interim a switch from coal to gas in the power sector could reduce carbon emissions slightly. A few weeks ago, Bloomberg wrote about the situation across Europe, specifically in Germany and France. Lower gas prices are reportedly hurting the profitability of nuclear in France. But in Germany, is there a true shift from coal to gas? Here are the numbers comparing the amount of conventional electricity generated by source in January 2014, compared to January 2016. There is no switch from coal to gas here. A nuclear plant was switched off in 2015, which accounts for the slight reduction in nuclear power generation. Otherwise, hard coal is practically unchanged. Lignite is down, but primarily because of tremendous wind power production. Remarkably, power from natural gas is also down, quite significantly, in fact. And this comparison of Januaries is not an outlier; a comparison of December 2014 and December 2015 reveals that natural gas dropped from 3.7 to 3.3 TWh. Natural gas obviously continues to be pushed out of the power market, but the low gas price is making natural gas profitable even at a very low number of operating hours. Germany has a whopping 28.5 GW of gas turbines installed, but in January 2016, these turbines never produced more than 13.6 GW – and they fell to below 4.0 GW about half the time. Gas turbines in Germany ran at a very low capacity factor in January – yet, we are talking about profitability again! The good news is that it apparently takes relatively little to get gas turbines out of the red. We have heard a lot of complaining about how mothballed gas turbines are a perverse outcome of the Energiewende. But German energy policies never made natural gas supplies artificially expensive, and the recent price plunge is not the result of any policy change in Germany. At least we now have indications that gas turbines running at very low capacities can be profitable. Going forward, gas turbines will once again probably be pushed out of the market in the summer, when power demand is seasonally low. Last August, natural gas only contributed 1.2 TWh to German power supply, a third the level of January. If gas is failing to offset power from hard coal now, it’s doubtful that would happen this summer – so expect even less electricity from gas turbines in a few months. In all likelihood, the situation will not change for gas turbines fundamentally until the last six of the remaining eight nuclear plants are shut down in 2021/2022. At that point, enough nuclear capacity will have been removed to make space for gas turbines – but also for coal plants. That, at least, was the conclusion we reached in our 2014 paper entitled the German coal conundrum. One other aspect could be interesting: ramping ability. Profits may shift from old-fashioned wholesale generation to fast reactions. 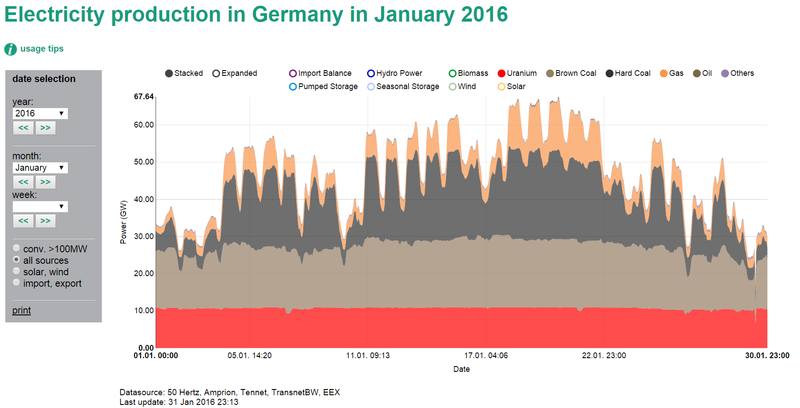 Conventional German power production has become very spiky, as the chart below shows. Here, we see several days on which the conventional fleet had to ramp up by around 15 GW in only eight hours – and down again by roughly that amount. (In comparison, the much touted solar eclipse last year hardly affected conventional generation at all). Remove all of the red area at the bottom representing nuclear power, and you can imagine how much space will be created for gas turbines at the top. The question is whether Germany’s gas turbine fleet can remain in business, if not profitable, during that timeframe. It’s another six years, which is not exactly short – even in a sector used to thinking in decades. Gas turbines may survive those years with profits in the winter and losses in the summer, roughly breaking even for the year. The next two nuclear reactors that go off-line in 2017 and 2019 will provide a little bit of breathing room. Huh. If gas prices dropped so much over the last year, then why did my heating gas provider just hike up my monthly rate by 25% at the turn of the year? No, I didn’t use significantly more gas last year than I told them I would when they calculated my previous rate. The year-end leftover bill was peanuts. I’m pretty sure they’re not simply gouging me out of greed – they’re still one of the cheapest providers available in my area, which means all the other providers must have raised their rate as well. So what gives?